Freddie has chosen lego pieces as his objects. You can see them on his picasa site. 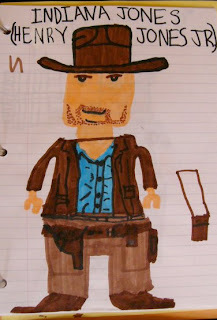 There are some other fabulous drawings of Mario, Luigi, Harry Potter, Mut Williams and 2 Face. Sunday, with a headache and lots of activity all around. I didn't really feel like drawing but knew that for once I had the time, so I should really make the most of it. I wandered around searching for a place that some of my objects would look natural in. 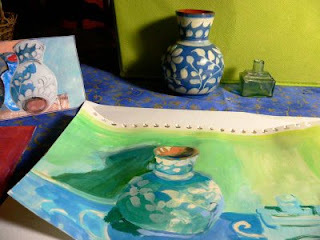 I wanted to create a still life that was incidental. I got a bigger piece of (pear coloured) pastel paper than I had been using previously... 30X40cm and started composing with a blue Sakura nouvel pastel: Carré. I guess some people are very intentional at this stage, but I frame the space a few times with my fingers and then don't really think. What's interesting is that it wasn't until I had finished that I realised there is a white line through the middle of the horizon. The decisions were not methodical. The repetition of form just happened. The jaunty tilted bowl felt right. I think I feel satisfied with this drawing because it has the sense that I came upon the objects and was captivated by them. What Bonnard calls the 'sudden revelatory process of perception'. Perhaps some would say it's in some way sentimental... bordering on insipid, but for me it is collection of familiar objects that are intrinsic to my life and let's face it I am a romantic. I meant to use a plate full of pastels I selected before I began drawing, but instead used the Carré pastels almost exclusively. They are harder than the sort I gravitate towards normally. The robin's egg blue inside the bowl is a very soft Schminke. Let's hope that when I look again at this that I still respond. I received some pages from a sketchbook this afternoon. It has been a good day for drawing! Katy has also uploaded her picasa album. See comments below for the link. I like the idea of a live object (the pumpkin, or is it a gourd?) We will watch its demise with interest! 'Seeing comes before words. The child looks and recognizes before it can speak. I know that some of you have already begun to catalogue your objects. So that my limited technological know-how isn't a barrier to sharing your images, until I work out how you can post images yourself here, if you send me any images I can post them for you. Molly and I have agreed that we are going to keep a mood diary of objects. Exactly what that means is open for interpretation! Today I have a headache, so that will be an interesting experiment! My basket of objects is made up of a few characters. When I went to do the police line-up I discovered that the beer bottle was covered in a film of dust. He, for surely a brown bottle is masculine? has not been studied with the same intensity as some of the others. 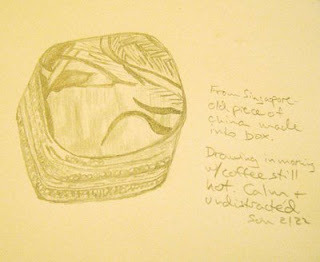 To view my objects you are invited to visit the picasa album below. Once you have I hope you will be inspired to catalogue yours. ... if you know how I put the picture I inadvertently deleted back, let me know! 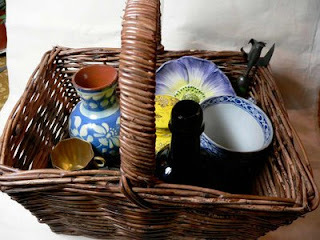 My objects are in a wicker basket on the table in my kitchen. Ideally, once a day, or at least once a week I will work with them. My intention is that what I do is not done in isolation, but is shared with others. 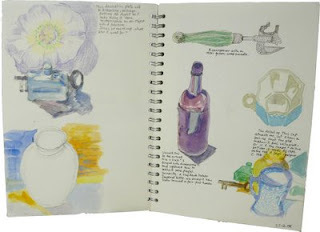 It has taken me about 6 weeks to begin the blog, so I have a head start - already ten pages of a sketchbook with ideas and images, thoughts and reflections. I haven't photographed my objects yet, though, so wondered if we began that way if that would help to establish a context for our joint endeavour? Sharing images on Picasa may be a way of sparking ideas about enquiries around our objects to explore and share together. So, gather your objects, catalogue them and let's see what happens. Why become part of the group? We are inundated with things, but fail to connect with many of the characters for very long. In our drawers, on our mantles, we sequester some of our key objects. But what is it to know an object, and how does knowing happen? 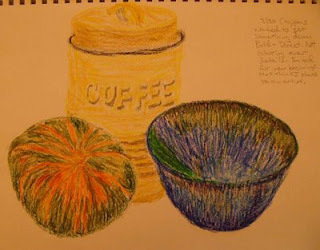 In this time of consolidation, I wondered if spending time with ten objects - really looking at them, listening to them, feeling them and imagining their stories – whether relationships between them would happen and what their impact on me would be. Are objects capable of depth of character? Can they change when they are understood more deeply? Are the more complex (shape, colour, line) more interesting over time, or will a shorthand develop to express these ten characters so that they will be equal? And how much will these characters be influenced by my mood, the season, light and time of day, for example? Will sharing the process of looking and representing with others make the process bigger and more meaningful? I have no fixed ideas: I have simply found ten items that interest me and I am starting to explore them. 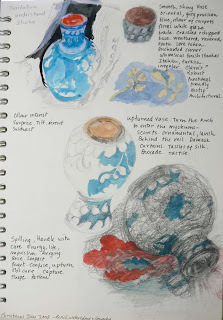 As I draw my first object (a vase), I labour over the rim and wonder if a bad drawing day will make me dislike an object and avoid it, or will I be more determined and draw it repeatedly in lots of poses to make sense of it? I come to this with a history: layers of ways of understanding objects have been built up over time. 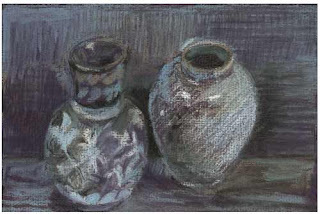 Morandi, Bonnard, Matisse, and others inform me. 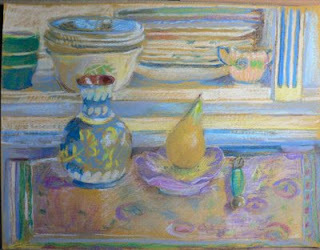 A show at Kettle’s Yard (Cambridge) in 1996: ‘The Language of Things’ helped me to think more deeply about the idea of still life. That together with years of looking may be the source of this exploration. Kenya and the habit of drawing an area around my house over a period of two years, watching the light and subtle changes of season, helped me to understand that there is nothing mundane in the familiar. John Berger’s Ways of Seeing has helped me to understand my relationship with what I draw and what I see. 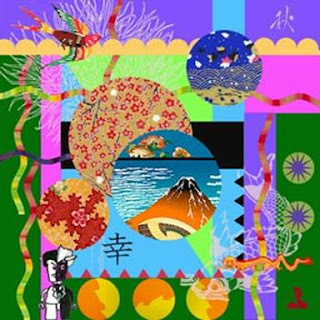 For me, thinking creatively about the world around me, while being in it and representing it is key to my equilibrium. Finally Jennifer Bartlett’s In the Garden is a response to being in a place that is not inspiring. I live with inspiration all around me but do not always take the time to be with it; this is an attempt to make space to let that happen.